I couldn't make out what relative was selling them ,a members of the Bourbon Parma Family? I would guess so. It’s surely an impressive necklace. Something royal families should grab, if they can. A necklace like that need to see the light of day again: on the royal stage. The articles about the sale don't specify which member but say they are on sale by the Bourbon Parma family. There are other pieces up for auction in this collection including a tiara. The tiara was said to have been given to the wife of Duke Elia of Bourbon Parma. It seems likely the other jewels belonged to them as well. I guess not impossible but seems likely one person/family put all the pieces up. The only child of Elia who even married was Infanta Alicia. She died last year. I wonder if it is just a coincidence or if the pieces past to her on the death of her parents and brother, and they are being put up for auction by her heirs. 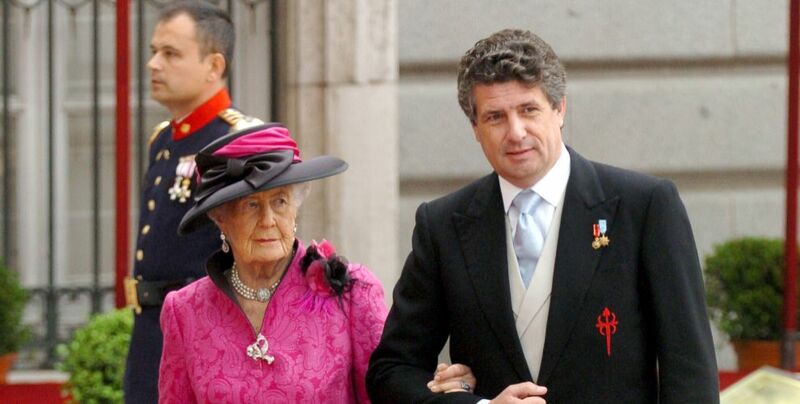 Infanta Alicia wearing a pearl necklace and a brooch that will be auctioned. The Bourbon Parma pearl necklace and a brooch are exquisite and I could picture them on queen Sofia though I doubt they will make their way into the Spanish jewel chest. Princess Alice never allowed Princess Anne de France , her daughter in law , to wear any of her jewels ! Yes I was wondering why Infanta Alicia's daughter in law Anne d'Orleans never wore any of the Bourbon Parma gems,was the relationship sour? Yes, and Her Sun (Anne's husband ) , the Infant, died before her ! The Faberge aquamarine tiara was made in 1904. It was given as a wedding gift from Frederick Francis IV, Grand Duke of Mecklenburg-Schwerin to his bride Princess Alexandra of Hanover and Cumberland. The tiara is up for auction for $230,000.